Imperium in Imperio (1899) was the first black novel to countenance openly the possibility of organized black violence against Jim Crow segregation. Its author, a Baptist minister and newspaper editor from Texas, Sutton E. Griggs (1872–1933), would go on to publish four more novels; establish his own publishing company, one of the first secular publishing houses owned and operated by an African American in the United States; and help to found the American Baptist Theological Seminary in Tennessee. Alongside W. E. B. Du Bois and Booker T. Washington, Griggs was a key political and literary voice for black education and political rights and against Jim Crow. 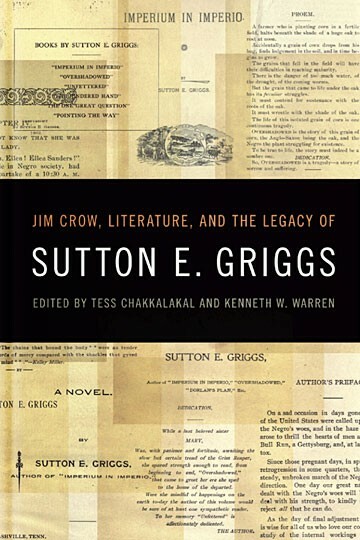 Jim Crow, Literature, and the Legacy of Sutton E. Griggs examines the wide scope of Griggs’s influence on African American literature and politics at the turn of the twentieth century. Contributors engage Griggs’s five novels and his numerous works of nonfiction, as well as his publishing and religious careers. By taking up Griggs’s work, these essays open up a new historical perspective on African American literature and the terms that continue to shape American political thought and culture.